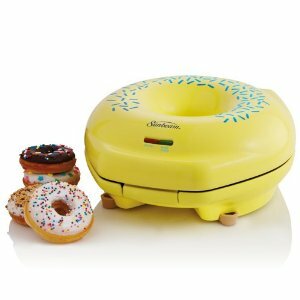 This Sunbeam Donut Maker is one of those great fun kitchen gadgets that is so much fun for busy moms with kids! Sure it’s not a ‘must have’, but it’s certainly a ‘nice to have’. So indulge yourself once in a while! At $29 Shipped it is a good deal on a 4.5 Star reviewed product. The Sunbeam Donut maker will make fresh donuts in just minutes. It makes 5 at a time, in this easy to clean, and simple to use donut maker. If you eat Gluten Free then giving up on certain treats can be difficult, so you sometimes have no choice but to make things at home. Finding gluten free donuts to buy is really difficult. So indulge yourself once in a while if you are gluten free and get a donut maker!